First I want to have a moment of silence for my old fit bit. It served me well for about a year and then slowly but surly began to fall apart. Using various adhesives I was able to hold it together for a few weeks until my new ionic arrived. Thanks little fit bit buddy- you did good. Setup took a long time but it was pretty painless; the watch updated and was configured within an hour and there were no unexpected issues. Comfort: Wow. New band is exceptional- love the way the updated clasp works. Light and unobtrusive. Appearance: Very classy. Nice large face (I don’t like small watches). A bit boxy in appearance. Beautiful color screen (my pictures don’t really do it much justice). Functions: Typical stuff like timers, steps heart rate, etc. Meditation app, coach and the ability to load your music on are nice extras. Built in GPS is exciting. Also, the ability to swim in the ionic could come in very handy. Nice to read texts / notification on my watch (although the vibrating is tinny and annoying). One other annyance: You can set the ionic to show you messages receive on your phone. Texts are fine but when there’s a reminder alarm the ionic let’s you know… over and over and over. You can to disable it on the phone side. Accuracy: The GPS matches my Runkeeper app quite well. Gets walks / runs without GPS incorrect (and the editing feature is not working). Auto logging cuts off a significant amount of, foe example, a walk. Hear rate monitor accuracy seems to be better. 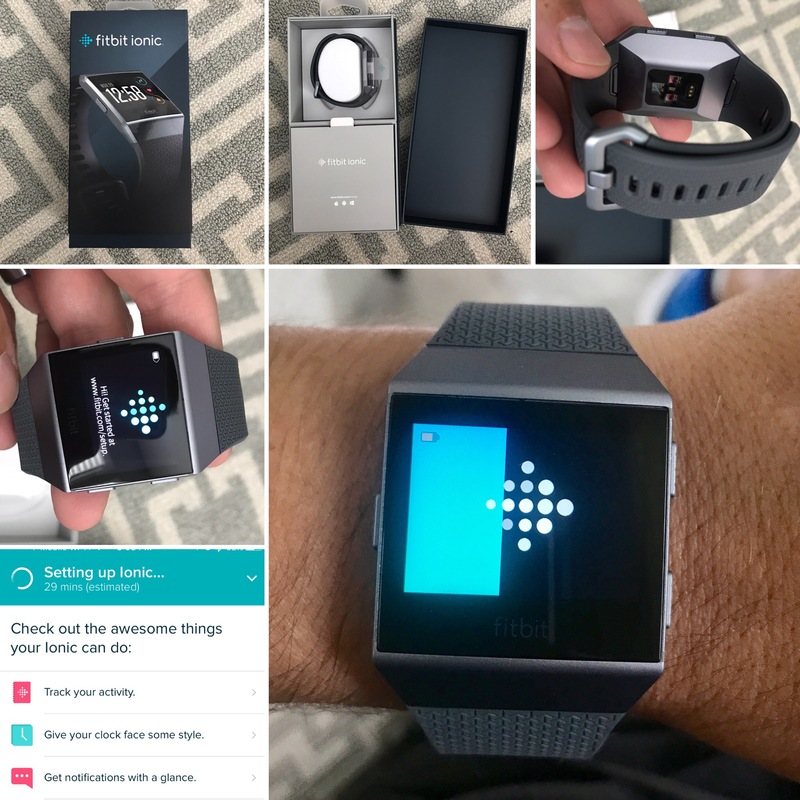 A very solid offering from fitbit! I’m quite happy with the watch so far and I’m excitied to see how it works and wears as time goes on. The fitbit app remains the same and I find it to be one of the most comprehensive heath apps available. 10/15/2017 Update: I just realized the other day that I was sent the wrong color watch. I’d ordered the black / grey but I was sent a blue / grey. However I think that ended up being a good mistake; I really like the color of my watch. Also, one thing about this ionic really bugs me. If you have the “Notifications: Receive notifications from phone” set to “on” you can see text messages displayed on the watch’s screen which is great. You also get notifications from alerts (i.e. calendar events) sent to you phone… and they keep coming. The watch will continue to vibrate until you actually look at the notification on your phone. I don’t know if that’s the way it’s designed but it’s very irritating. Every morning Fran makes a veggie juice concoction and each morning I drink it. I think it actually might help! I just want to publicly thank her for taking good care of me. Biggest Looser is starting back up today and I’m pretty sure that will help jump start my health efforts. Chloe turned two this past week! We don’t have giant parties for the little ones (we wait until they ask), but she still got a cake and some fun presents. Below is a video of her blowing out her birthday candles. Do you think she knows what’s going on? For FHE we went and picked out some pumpkins (I think Macey’s is a good place to get them). This year they had some decorative pumpkins which piqued the interest of the kids. Part of me likes carving pumpkins (possibly next week) but another part of me wants to scream and throw them at people I hate. Last weekend we took a quick trip to Moab for some biking and sightseeing. We started our trip by discovering we had the wrong size hitch for our bike trailer which put us an hour behind schedule (and the bad weather didn’t either). This was our first trip in the Yukon and the kids were pretty much glued to the TVs. Fran navigated us up I-15 to extend the road trip since the ride was so wonderful (this is sarcasm). We opted not to rough it this time around and stayed at the Aarchway Inn. The room was spacious and well maintained (three queen beds!). The hotel property was also very nice and included a giant playground, a parkour course, picnic areas and lots of open space (some mud too… the kids loved it). Hotel highlights: Mercilessly raiding the vending machines, hotel breakfasts and a splendid dip the pool. 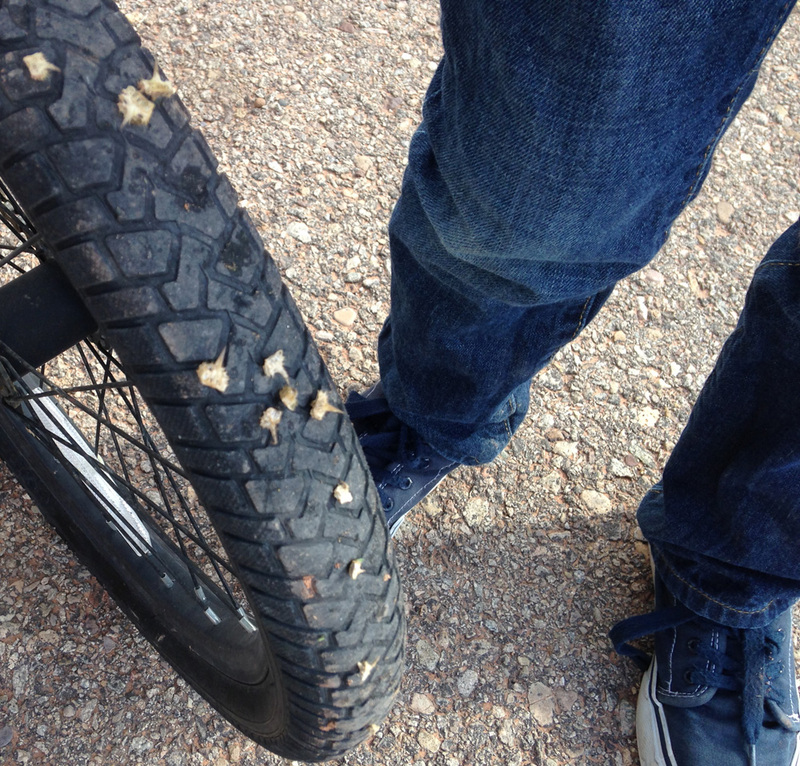 Biking didn’t go quite as we’d hoped. Getting the bikes & helmets adjusted took more time than we expected. And then only about 1/4 mile into our trip disaster struck. We hit a cluster of thorns that ended up popping seven of our tires. We were able to temprarily fix most of the tires and managed to make it another few miles down the path (which was beautiful) but ultimatley we had to cut our biking excursion short. I guess we’ll have to go back to bike another time. On the way up to Moab I requested that we try to find good (tried and true) food to eat. Fran assured me that we would be relying on Trip Adviser and that I was in good hands. Our first day in Moab Fran said we were going to eat at the Mandarin Szechuan buffet. Once we had tried the food it was clear something was very wrong- it ranks among the worst buffets I have ever tried. Fran confessed that she hadn’t checked Trip Adviser. She had seen the Asian buffet, got excited and made an “emotional decision”. It was bad food, but I have to say I think my wife is pretty cute! Our next meal was at Zax (4/5 starts on Trip Adviser). It was better than Szechuan, but over all the mean was only so-so (really dry pizza). I guess you can’t necessarily trust reviews either. What say ye Moab travelers- where should be eat next time? 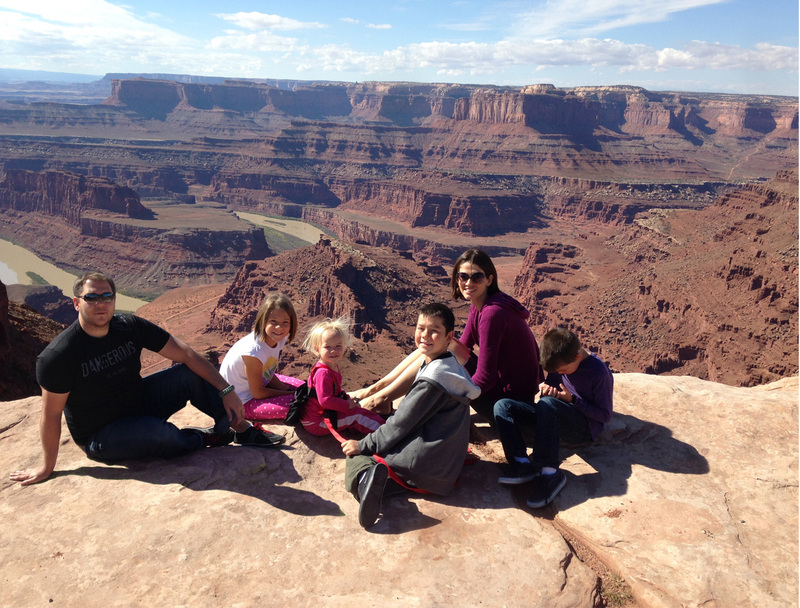 On the way back from Moab we decided to trick the kids and made a detour to Dead Horse Point. Man, what a view! I found a good place to hang off a “cliff” for the obligatory “I’m about to die!” picture. If this had been real I’m pretty sure my kids would have stepped on my hands. And a lovey panoramic view from the edge of Dead Horse Point. If you haven’t been here before it’s worth the quick detour. Arches opened back up while we were in Moab. It would have been fun to do take a quick drive though the park, but the kids weren’t up for it. All in all I think we came away with a lot of good memories of trip that didn’t go quite right. Next time will be better. Some text here… a bit here, and voila! A blog post. Mike’s bike is in a perpetual state of disrepair from constant abuse & neglect. It seems like every month we have to repair a flat or make some of kind adjustment. We used to drop his bike off at a repair shop, but that got expensive so we started doing repairs ourselves. This last time I had Michael help me (I think Fran told me this fulfilled a scouting requirement). He was a pretty good helper. And then we voted. The line was excessively long- I waited almost two hours- but I didn’t mind (thank you iPhone!). I would have gone later in the evening, when it turned out there was no line, but had other plans. I have a few thoughts on the election. I don’t want to go into too much detail, but I’m not particularly pleased with the outcome (though not surprised). I don’t feel like we accomplished much as a country in the last four years. Obviously I don’t put the blame completely on our president, but I think he shares some of the responsibility. What really worries me for the time being are taxes. I don’t mind if the Bush-era tax cuts expire, or if some deductions are eliminated here and there, but I do mind a tax increase. President Obama has made it clear that he intends to raise taxes on the rich. Maybe that, in and of itself, isn’t a bad idea. But to Mr. Obama I look like a very wealthy citizen instead of a business. My company is a pass though S-corp which mean that on paper my income is the same as my company’s income. So, to clarify further, on paper I appear very wealthy. I’m already in the highest tax bracket. Paying more taxes would simply hurt my company’s ability to grow. If we don’t grow then we don’t employ. It is the small businesses that drive the US economy. I feel like treating small business income like personal income is a mistake. In the next year I expect to pay nearly $100,000 of additional taxes. That’s money I could have used to increase inventory, expand, add employees or stimulate the economy. I also worry about health care issues. This coming year companies with over fifty employees will be required to provide health care coverage to their full time employees. We already do this and it’s very expensive. Premiums keep rising. I worry that a mandatory health care program will drive prices up even more and eventually become a financial liability for us. In the meantime many companies are hard at work cutting hours of full time employees so that they don’t have to provide insurance coverage to them. The net effect is that many of these workers end up with less money and they will now be required to purchase their own heath care (that’s a double whammy). Sometimes I feel like the laws that have been created to help have unintended harmful consequences. Sure, I’m oversimplifying some things and the thoughts I’m sharing are comprised of a limited issue scope, but my point is that I’m worried. When a county reaches the point where the takers outnumber the givers there is an unsettling imbalance and the future seems bleak. Since my Vette has been gone I have parked the Camaro in the garage. I ended up reorganizing things again so it could fit. The kids are getting older so I pulled out one of the shelves in front of the car and pushed the remaining shelf back a few feet. I know this will seem like a funny thing to say about a garage, but it really opened up the place. I had to do a lot of shifting though. All the garden stuff and the tools had to go in the shed ( I put a shelf in there- it makes me so happy). So then I had to take some of the shed stuff that we don’t use often to a storage unit (we actually don’t have any storage room in our house so I caved and got this unit… I am sort of ashamed, but mostly happy). And here’s a glimpse of my super secret project. But it’s not really super secret. We’re giving the home office a makeover. We’re in a month in at this point. Slow and steady. A quick update on Fran’s foot (toe, technically): The healing is going slower that we had hoped. Apparently all the walking around she was doing made exacerbated the wound’s bad mood. No more walking! On Wednesday we finally picked up some crutches. Thanks to those of you who have wished her well and sent money (which is, of course, appropriate in this situation). On Saturday night I took the kids to see Wreck-It Ralph while Fran took it easy at home. What a cool movie! Visually appealing, good plot and right up my alley (8/10). All the kiddos made it way though without falling asleep or using the bathroom (that I know of). On Sunday we went to the Lott’s new home for dinner. 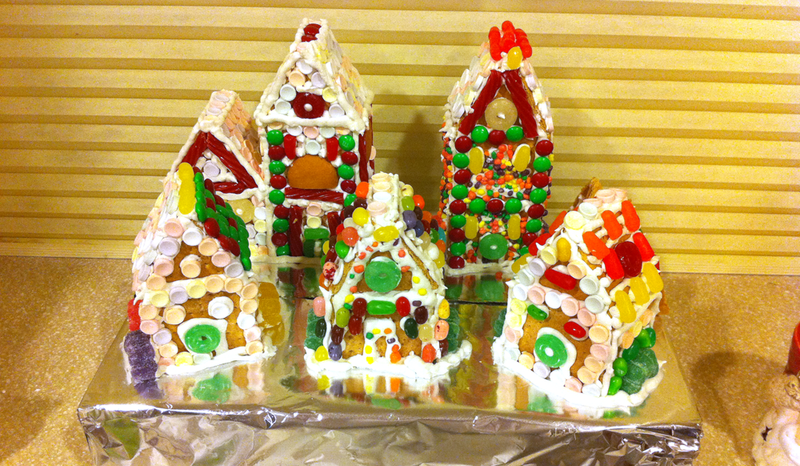 Despite not having a kitchen it went smoothly. Fran made pecan pie and pumpkin crème brûlée. Hopefully there will be more of those in the future. When we got back I was secretly planning to have a giant pile of pecan pumpkin crème brûlée covered pie, but alas it was gone. “But he has two sports cars! Surly he can pay more taxes!” You know what? If I really thought the government would take additional tax revenue and use it to to pay down the deficit then I might not feel so unhappy. Where does the time go? A question that millions of people ask each day. And yet there continues to be no answer. What can be done? Capture as many fleeting moments as possible, I guess. Claire lost her first tooth (left central incisor)! Michael spent a long time tying floss to her tooth, but it kept slipping off. Ultimately it just wiggled free. Claire put the tooth under her pillow and – don’t judge us – the tooth fairy forgot to come. Claire wrote her a hilarious (albeit nasty) note. Luckily the tooth fairy came the next night. Gabe is a funny kid- his attention span is incredible. The other day he came home from school and, without taking his backpack off, spent about an hour coloring a picture which he then folded up into a “robot.” He has also been building “forts” next to his bed (out of cardboard boxes) and sleeping in them. Fran was called as the Den Mother of the Wolf Den (Michael is in that group). This past week they made tool boxes (and a mess). On September 20, 2012 the Brigham City LDS temple was dedicated. Since Michael was old enough he got to attend the dedication ceremony (he would have rather gone over Niagara falls in a barrel). Chloe turned one this past week! Given that nearly 80% of kids don’t make it to their first birthday we’re pretty proud of ourselves. Few things are as enjoyable as watching a one year old open presents. Chloe had no idea what was going on but she was delighted. She scored some sweet lute like a drawing board, and some stuffed animals from her siblings. Cam is working on a super secret project. We were able to capture this image of him…doing something. To be honest, it looks like he’s stealing furniture from work. But Cam wouldn’t do that… would he? I’m certain more information will be forthcoming. Speaking of Cam- with four days of his Onstar six month trial left Cam decided to activate the Onstar iPhone app (having never used any of the Onstar services) . You can monitor all your car’s vitals, and lock and unlock your car from your iPhone. Of course this only works if you don’t mind waiting. And waiting (slow app). Unimpressed Cam called to end his Onstar service and they gave him the “If you deactivate this service we can’t help you even if you’re in a crash and are burning to death” scare tactic. Cam has no fear. Goodbye Onstar. The new store at work is coming along. This past week the drywall was put up. The build-out is over a month behind schedule at this point so setting up the storefront will have to wait until next year. So ends another couple weeks in the life of the Hughes Family. I don’t know how many more blog posts there will this month. I have a lot of irons in the fire right now (work expansion, car project, secret project, working my way through Breaking Bad, etc).